Ocean View one bedroom private entrance suite, queen size bed & private full bathroom with conveniences of bathrobes, slippers, and hairdryer. Our location is just minutes from the beachfront, and public transportation is available to the Vancouver area. Tourism BC approved accommodation. Ocean views from your suite. The suite has it's own large furnished sundeck. Cable TV, stereo, and large windows facing the ocean. Kitchenette facilities include; microwave, toaster,coffee maker, fridge, and utensils. Room for 4 to dine. Bedroom... with reading light, desk, and closet space. Private full bathroom... features bathtub, shower, bathrobes, slippers, hairdryer. Your suite has it's own private entrance and parking area. Walk to White Rock beach in minutes. 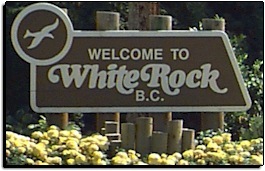 The White Rock beach area offers extensive walking, hiking, restaurant, and shopping opportunities. Colorful sunsets over the bay on clearer nights. 2 day minimum, non smoking. Surcharge from Dec 22 to Jan 04. Convenient bus service to Vancouver, airport pick-up can be arranged.